Richard Lee is a resident of San Antonio, Texas who finished sixth in the 2006 World Series of Poker, winning $2,803,851. He is semi-retired from a jewelry business and has had great financial success as an investor. At the final table, Richard refused endorsement deals from all of the major online poker rooms, choosing instead to wear a San Antonio shirt at the final table instead. Richard Lee was born in Honolulu, Hawaii, but had lived in San Antonio his entire life, minus one year. He said that he was proud to represent, God, his family, and the city of San Antonio at the World Series of Poker. At the final table, Richard Lee was eliminated by eventual winner, Jamie Gold. Richard Lee had been tired of Jamie’s bullying at the table and moved all-in with pocket jacks. Jamie called with pocket queens and sent Richard Lee packing. 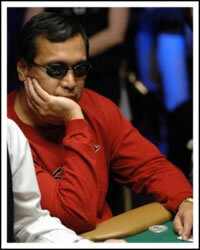 In addition to his WSOP appearance, Richard Lee had a 12th place finish at the 2005 Grand Slam of Poker in Los Angeles.